← Does The Climate-Science Industry Purposely Ignore A Simple Aspect of Strong El Niño Events That Causes Long-Term Global Warming? This is a quick introduction to the 2019 paper The “Ocean Stabilization Machine” May Represent a Primary Factor Underlying the Effect of Global Warming on Climate Change by Mao et al. (pdf here). I believe many visitors here would find interest in their projected decrease (yup, decrease) in global land surface temperatures by the early 2100s and their conclusion that the recent global warming may have occurred primarily through natural factors. Global cooling? I’m against it. Considering how cold it is outside my home this morning (about -18 deg C, or roughly 0 deg F), I’m glad I have a fossil-fuel-powered heating system. Brrrr. A recent post New Paper: Modern Warming Was Driven By ‘Primarily Natural’ Factors. Global Cooling Has Now Begun. authored by Kenneth Richards at Pierre Gosselin’s blog NoTrickZone introduced the Mao et al 2019 paper that’s the subject of this post. Figure 3 from the paper is presented below. Some readers may find the paper interesting. 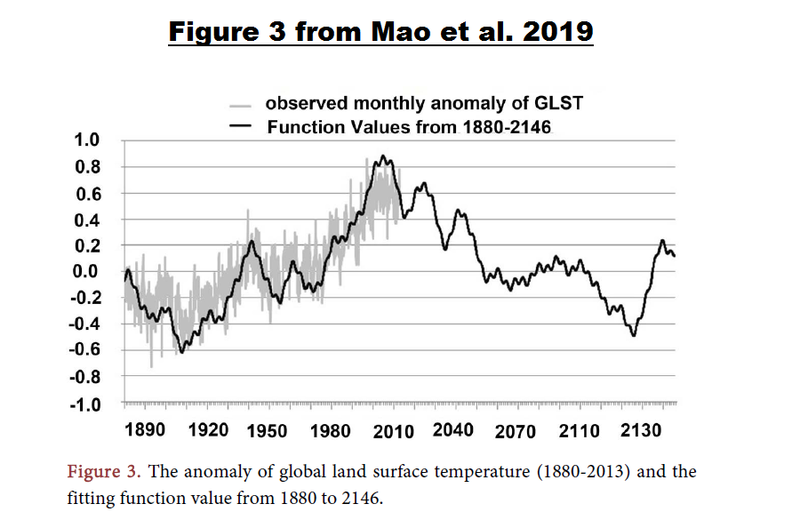 Contemporary references to global warming pertain to the dramatic increase in monthly global land surface temperature (GLST) anomalies since 1976. In this paper, we argue that recent global warming is primarily a result of natural causes; we have established three steps that support this viewpoint. The first is to identify periodic functions that perfectly match all of the monthly anomaly data for GLST; the second is to identify monthly sea surface temperature (SST) anomalies that are located within different ocean basin domains and highly correlated with the monthly GLST anomalies; and the third is to determine whether the dramatically increasing (or dramatically decreasing) K-line diagram signals that coincide with GLST anomalies occurred in El Niño years (or La Niña years). We have identified 15,295 periodic functions that perfectly fit the monthly GLST anomalies from 1880 to 2013 and show that the monthly SST anomalies in six domains in different oceans are highly correlated with the monthly GLST anomalies. In addition, most of the annual dramatically increasing GLST anomalies occur in El Niño years; and most of the annual dramatically decreasing GLST anomalies occur in La Niña years. These findings indicate that the “ocean stabilization machine” might represent a primary factor underlying the effect of “global warming on climate change”. Have fun in the comments below and enjoy the rest of your day. This entry was posted in Natural Warming, Uncategorized. Bookmark the permalink. Thanks for your posting, Bob. But, as usual, I’m forced to WUWT to find comments. A shame, but the more trafficked site gets the notice! Some of us love you anyway. This seems a strange sort of study Bob and I don’t think anyone can be sure what the global temp will be in 2100 or beyond. But if we move back in time just 9 years to Feb 2010 and Dr Jones’s interview with the BBC and then forward to today we see temps adjusted down for earlier warming trends and higher for 1975 to 2009 trend. Bob have you looked at Jones’s interview and question A and do you understand why they changed the HAD Crut 4 data trends in such an obvious way in such a short period of time. We’re told that this is the data-set most favoured by the IPCC, so I think it’s important that interested parties should keep a close eye on their ongoing adjustments. What do you think of that interview Bob and the changes made?